The Guild awards keep coming. Tonight, it was the turn of the Screen Actors. Exactly as the producers did last night and the directors and writers will do in the weeks to come, the actors awarded themselves. 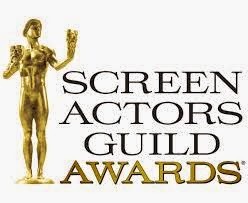 Showing a severe lack of imagination, the award is called "The Actor." -- As the reviewer of this show, I was thrilled by this win. I'm not sure it is completely deserved, but it certainly is an ensemble. -- As the camera panned across the cast, I was struck by the diversity and the varying body types of each of the women who are members. Congratulations to this wonderful show. -- Her speech made me cry. She got the job on OITNB the day she decided to give up acting. Wow! -- The award was presented by her daughter, Carrie Fisher, who gave an odd speech. Never mind. It may have been made sixty-three years ago; she may have done dozens of things since; but, Debbie Reynolds will always be Kathy Selden to me. If you've never seen Singin' in the Rain, stop reading this and start watching. Although we didn't do a formal red carpet view for this show, sunbunny and I couldn't help making a few comments. My choice for best dressed was Tatiana Maslany. I loved her dress and I loved how poised and articulate she was on the red carpet. Why this woman isn't nominated for simply everything escapes me. sunbunny's choice was Viola Davis who "looked positively ethereal." I tend to agree. We agreed on the worst dressed. Sorry, Lorelei Linklater. This whole ensemble is simply disastrous. What you can't see in this photo are the blue hair extensions. Wow, but they didn't work at all. ChrisB is hoping for a snow day tomorrow. It's nice when the speeches are well thought out and really make an impact on the industry or the wider society.